Most studies of Jews in the period from Alexander to Trajan have concentrated almost exclusively on Jerusalem and Judea. 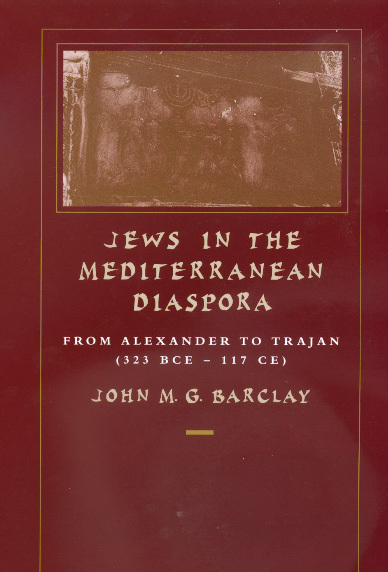 In this book, John Barclay assembles and analyzes evidence about the Jewish communities in Egypt, Syria, Cyrenaica, Rome, and Asia. Barclay's ambitious goal is to describe, as precisely as the evidence allows, the varying levels of assimilation and antagonism between Jews and the non-Jewish communities in these areas for this 440-year period. With a concluding review of Jewish identity in the Diaspora as a whole, this book provides our first comprehensive and multi-faceted survey of Diaspora communities and Diaspora literature. John M. G. Barclay is Senior Lecturer in Biblical Studies at the University of Glasgow. He is the author of Obeying the Truth: A Study of Paul's Ethics in Galatians (1988).